Whether you are camping in a National Park or glamping at your favorite motorcoach resort, the words “no internet” can be as scary as an empty fresh water tank or dead batteries. Even in places with the oft-used but less often implemented “free Wi-Fi”, sometimes the internet can be so slow that consulting your favorite app for a campground or a map to your next stop is impossible. 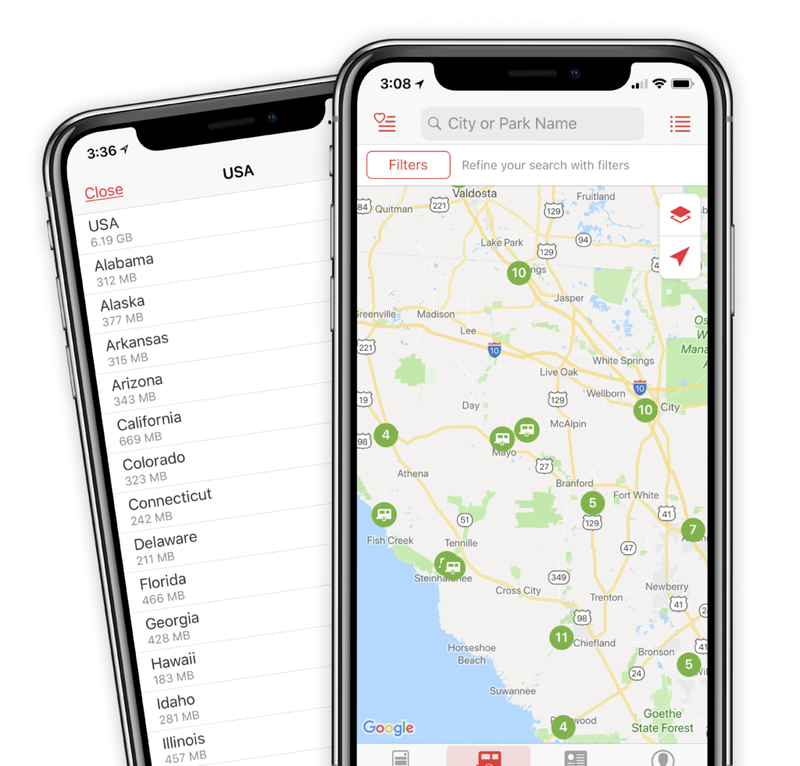 With a subscription to the new RV Life app, you don’t need an internet connection to access maps and campground details. With a subscription to the RV Life mobile app, the lack of an internet connection is no longer a problem. You can download maps and campground details for the entire US, Canada, and Mexico, or just choose a few key states within your travel path. The RV Life app gives you the ability to explore those maps and campgrounds while offline with no internet connection. Download offline maps and campground details for the US, Canada, and Mexico. Whether you are in Devils Tower Wyoming or Devils Playground in Utah, you can have access to the rich database of campgrounds backed by RV Life’s exclusive integration with Campground Reviews. If it’s your plans that move you or just warmer weather, you’ll have the freedom to find a new destination, wherever you are. The offline map access is just one of many features in the RV Life app. You’ll find the option to Download Offline Content in the Account section of the RV Life app. Custom built for both IOS and Android separately, the RV Life app uses the natural feel of your device’s native operating system to give you a unique experience on either platform. Navigate over to the Parks section and the RV Life app will show you a vast array of parks and campgrounds. Too many choices? Narrow down your campground selection by tapping the Filters button and selecting the features that are important to you. Whether you are looking for those rustic state and National Park sites, or the 50-amp big rig locations with full amenities, the choice is yours with RV Life’s flexible filtering options. Tapping the green camper icons on the map will reveal a banner at the bottom of the screen with the name of the campground, distance from your current location, and its Campground Reviews rating. Just tap the banner for a detailed review of the campground. You’ll also find the address, phone number, and directions to the campground or park you have chosen. The RV Life app gives you the ability to view maps and campground details on your mobile device, while offline without internet. Subscribe today. Watch for more articles in our RV Life feature series.